I want to start off by apologizing for the abrupt end to season 1 of the HammerShed Podcast. As it sometimes does life hit me with an incredible whirlwind of chaos. Family time, coaching responsibilities, the holidays, and work left me with no time for the show. The last several weeks away from the show did give me some time to recharge and revamp. 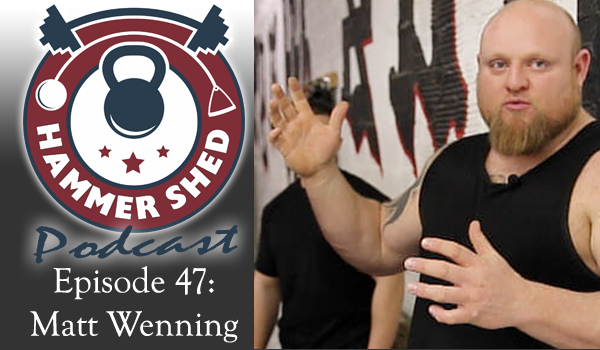 Moving forward the HammerShed podcast will focus on our largest audience, powerlifters. Although not exclusively a show for powerlifters The HammerShed Podcast will spend the majority of our time discussing strength sports. Season 2 will be a 8-15 episodes in round table format. Please stay tuned for more details. On this episode Bret and I speak with internet sensation Jujimufu. We talk about his work in tricking, bodybuilding, and keeping fitness fun. Jujimufu shares with us his thoughts on flexibility, his approach to maintaining his size and agility, and he shares stories of some of his most famous videos. Please be sure to check out his website acrobolix.com for his book Legendary Flexibility, clothing, and other great merchandise. On this episode Bret from Constant Forward Progress and I do some catching up on our training and talk about our new Facebook Group, HomeGrown Strength. We start the show talking about how I was able to squat everyday for a year and what my thoughts on the experience were. I tell Bret that I think this is a practice (Squatting Every Day) that is absolutely doable but does not suite my current goals. I’m focused on powerlifting goals and need to spend more time deadlifting and doing other leg accessory work. Squatting everyday takes aways from my ability to do that. Bret says his training has focused more on better pull ups so that he can progress to a muscle up. He also shares some exercises he does to increase shoulder mobility. Bret says back bridge variations are a great exercise for increasing mobility. I then share the details for our new Facebook group, HomeGrown Strength. HomeGrown Strength is about pursuing strength at home, in your garage, backyard, or neighborhood park. You don’t need a 10,000 SQFT globo gym to be strong. HomeGrown Strength is here to support your strength and fitness goals, we are here to share what we have learned from building our own home gym, and most importantly we are here to make you STRONG. On this episode I speak with Brandon Senn, Head Coach of Virtual Coaching at Kabuki Strength. He and I discuss the use of autoregulation in strength training. We explain its benefits, different types, and how to incorporate it into your programing. Brandon says he wasn’t always a huge fan of the weight room as he found more pleasure in playing sports in high school than preparing for them in the weight room. He notes that he has always had a love for sport and competition. To fill that void after high school he found powerlifting. Brandon says his coaching started at a commercial gym but found his coaching philosophy and their business model just wasn’t the right fit. He met Chris Duffin at a powerlifting meet hosted at Elite Performance Center. He felt that working there (Elite Performance Center) was a better fit for him and his clients. Currently the athletes he coaches are powerlifters, strongmen, and a couple crossfit athletes. Most of his coaching is done online but does some coaching at the Kabuki Strength Lab too. I then asked Brandon to explain the origins of Kabuki Movement Systems (KMS). He says that, KMS filled a need for a movement based system for strength sports. There are always a time and a place for mobility work, rolling, etc… KMS though, addresses common movement issues with athletes, not only to reduce injuries but also to increase performance/strength. It’s a system that helps athletes be more efficient movers, which increase force production. The main topic of the day is auto regulation. For those of you who are not familiar with what that is, auto regulation as a concept, is the ability to manage training load based on a series of defined metrics. In general there are two different types of metrics. Subjective metrics which include rated perceived exertion (RPE), reps in reserve (RIR), or other questions based around describing how difficult a movement felt. Objective metrics are the other type, these include measured bar speed, heart rate, and reps to failure (AMRAP). The benefit with objective metrics when utilizing autoregulation is it keeps you honest and it’s harder to fake. We talk about how there are times when we FEEL good or FEEL bad but the objective metrics show otherwise. In those cases an athlete might make adjustments based on a feeling that would not optimize their training. Brandon does say that there are a time and a place for both methods, and cites work from people like Michael Tuchscherer who uses both methods in tandem. Brandon talks about how Dr. Brian Mann in working with some of his athletes has found that when they measured athletes bar velocities at certain prescribed percentages they were actually working in ranges undesired for what the programming called for. Cases like this show that not everyone is the same and having some hard data to show us what is really happening can be beneficial. I then asked Brandon to describe the different types of velocity devices. There are two main types, wearable devices and tethered devices. Brandon tells us that there are also some optical devices but tend to be too inaccurate or cost prohibitive. Brandon thinks that the future will be in wearable tech but right now tethered devices are far more accurate. Currently Brandon’s favorite device is the Squats and Science Open Barbell v2. I asked Brandon to explain typical usage of a velocity device for auto regulation. He says that any program that uses percentages for training load can use velocity monitoring to make it even better. He uses a technique called velocity profiling. It defines what velocity you should be at for any particular percentage of your one rep max. Not everyone is the same and we all travel at different speeds for different loads. The profiling helps clear up the guesswork so you can select weight to match the prescribed percentage for your training. If you are looking for more information on velocity based auto regulation be sure to check out www.Kabukistrength.com where you can find Brandon’s Autoregulation Book of Methods. Other great resources are Dr. Brian Mann , Eric Helms, and the kabuki.ms forum. Another article we mentioned at the end of the show was “How to Create a Yearly Training Plan” be sure to check this one out, as it’s a great read.